Lonicera fragrantissima.© Gary P. Fleming. 2014.Virginia Botanical Associates, Blacksburg. www.vaplantatlas.org. (Accessed 5/2014). Lonicera fragrantissima is a shrub to about 3 m tall, twigs slender, smooth, tangled. Leaves opposite, semi-evergreen, stalks very short, blade, dark green above, pale gray-green below, rounded, 3-7 cm long, tip pointed, margin finely fringed, stays green into late fall, leafs out early. 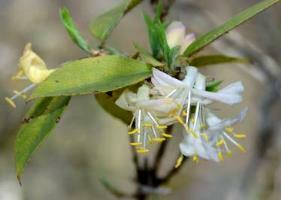 Flowers whitish, small, bilaterally symmetrical, lemon-scented, fragrant, small, March-April. Fruit dark red, fused berries, about 0.6 cm each, under foliage, April-June. Habitat: Escaped from cultivation, landfill edge.